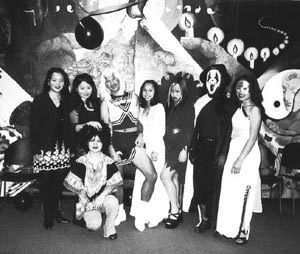 On October 30th, 1998 CSULB�s Cambodian Student Society and UCI�s Cambodian Student Association joined forces and hosted the Halloween Party. The party was held on October 30th in the Cultural Center at UCI. We are delighted to announce that it was a success! Many partygoers entered the scene wearing beautiful and outrageous costumes. The highlight of the evening was the the costume contest. There were approximately 30 contestants. The winners were Phany Kong in her �Lauryn Hill� attire and a student from UCLA in his �Hoochie Mama� costume. It was a night of fun and dancing. Also it was a sweet reunion for many of us as we met friends from CSULB, UCI, UCLA, LBCC, Cal. State Fullerton, San Diego State and many others. We would like to thank Nevada for his generosity in providing and mixing the wonderful musics for us once again.